Mum and I had a quiet weekend. Firsted it has gotten way too cool weatherwise around here. Mum shut all the windows on Caturday, as is was all cool, windy and sometimes rainy outside. She did lots an lots of laundry since she was just inside anyway. Sunday was sunny but still cool. I teleported over to Billy Sweetfeets purrthday party for a while. Mum did work outside using the grass cutting monster, cleaning the birdie's baths and making sure they had lots of foods. We sat and watched birdies for a few minutes, we are starting to see birdies coming back through to go south! That means (shutter) winter is coming on. Mums says Grampie will be coming over tonight to watch Brett the Viking on the moving picture box. We want to see the old man and how good he is playing. Happy Weekend every one! I first want to that each and every one of you for your purrs. Grampie passed all of his tests! Yay! They can't say exactly why his plumbing didn't want to work right a couple of weeks ago, but nothing bad like a tumor, mum says which would have been bad news. I cellybrated by indulging in a little bit of nip. Here is one of the bunches of morning glories blooming yesterday. It was such a cool day that they stayed open all day. Mum took these about 6 PM! Plus she noticed a flower along the bottom of the wall, the little plant was growing out of the crack in the sidewalk! Mum saw it a few weeks ago, but never figured it would bloom, it showed her, it did bloom. Nothing much else going on, mum says we should have a quiet weekend. Well, mum's day didn't quite work out for her. She took Grampie for his test, mum doesn't know if he passed or not, the radiator doctor guy has to 'interept' it. They will send results to his plumbing doctor. But then Grampie felt all dizzy so they went to see another doctor, who thinks he has a virus in his inner ear. But they could rule out stroke, brain tumor etc. So they gave him some pills for motion sickness and when mum talked to him a bit ago he was doing OK. The Wizard mum was going to see was Harry P! She hadn't had time to go see that movie yet. Mum says maybe next weekend, she goes to the matinee since it is a little less costly. Maybe if she waits a few more weeks it will be at the budget theater, but that isn't close. Otherwise she got all of her other stuff done that she wanted to do yesterday. Finished reading her book, shopped for foods for us, got her toes repainted. We are having rain and a few boomies too. The boomies didn't bother me as much as the pelting rain. I rain behind the couch and mum came to look for me and didn't see me. So she peaked UNDER the couch. She now knows that I can get under the couch, which is a tight squeeze to get under! She said I was OK, not to worry she wouldn't let the storm get me. Mum is happy, we need rain, our grass looks all brown in places. I gave my cat a bath the other day. He just sat there. Actually, I think he enjoyed it. It wasn't very fun for me, though. The fur kind of stuck to my tongue. - Steve Martin. I love Steve Martin, he is a funny bean. He even mentioned me in his book. Yes, he did mention Derby, I have proof. He talks about his Derby hat! Mum went off to play with racy cars over the weekend, but at a place close to home, just 20 minutes away. Plus they can only make noise between 9 AM and 5 PM so she doesn't have to leave early and she gets home sooner too. Mum is taking the day off from hunting, first to take Grampie for a test, then something about seeing a Wizard. I will be home napping. Yay gang, we made it to Friday. Mum has been busy with day hunting, Grampie and when she gets home has just done what she had to do. She has some painting outside to finish, but she says it is been too hot and stickie to do it. I figure I would help her out and keep the equipment company. I have been spending some of my time teleporting over to the UK to visit furiends. Fat Eric's beans brought him home and promplty left again. Plus Flynn and Eric's beans left them alone too. So I teleported over with Greenies in tow so we had lots of treats. That makes me tired, so I needed a few extra naps. Grampie past the first two tests yesterday, which made him and mum really happy. Two more next week. Mum and I thank you for all your purrs, I know they helped. Mum's morning glories are blooming. She is happy they finally started to bloom. She has some in the back yard too. What? Is he saying we have lazer beam eyes? Yes we kittie's do! Here is a nice picture of me with glowing eyes. This is one of mum's early pictures of me and also one of her favorites. The hot and stickies are here. After mum finished her outside work on Caturday, she didn't do much for the rest of the weekend. Well, she did get the shopping done, the laundry etc. But stayed inside with me where it was cool. We is hoping for some rain. Grampie continues to be OK, but will have some tests on Thursday. Enjoy this story of a kittie who came all the way from Iraq to win hearts and provide 'therapy' there and here. Grampie is doing OK, we have the hot and stickies here. Mum is done with the outside work in the hot and stickies. She says time for a shower. I say time for a nap. Thanks for the purrs for Grampie. It has been a furry long week., he is doing better, but mum had to take him to the ER Tuesday night after I posted. His plumbing isn't working right. Mum got a call just before sleeping time. She got dressed, turned off all the lights and left in the metal monster. She got back hours later, crawled in bed, then got up a few hours after that and went to work. Plus during that day they got see the specialist doc, he did some stuff that made Grampie feel better. He has test next week but is doing OK. Keep up the purrs please. Mum came home with a package today, she bought it to help a bean out at work who is off work with a brain tumor. They had all sort of stuff for people to bid on in a silent auction and this is what mum got. It is a bowl, bread and soup mix. Mum got something else, but I will share that later. What I like it that it has crinkley paper that I like to chew on! Now for Auntie Deb. 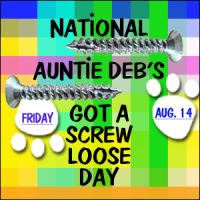 Loose screws? Yeah, its about time she admitted it! 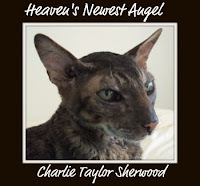 Farewell to Charlie Cat. You weren't with us on the CB for long, but we loved you and will miss you. Run free at the Bridge little guy. It's a big TGIF this week. Take care everyone. According to ledgend from Madagascar, a cat and a rat lived together in harmony until a famine arrived. When the two sailed away in a yam carved into a boat, the rate began nibbling at the craft, causing it to sink. Both managed to swim to ashore, but the cat vowed vengeance on the foolhardy rate...and it it's been ever since. Do you believe this story? Interesting, true or not. The hot and stickies went away for a day, mum has the windows wide open tonight. She says the weather guesses say the hots will be back tomorrow. Plus, can I get some extra purrs for Grampie. He is a bit poorly and mum had to take him to see the human VET today. Now he has to go see a special guy next week. I prefer not to get into deep water in the first place. No swimming for me! I had a lazy weekend. The hots and stickies are here, so even mum didn't do much. Mum wouldn't let me outside, even in my porch since it was so hot. But since the hots got here mum said she saw some flutterby's on Sunday when she was sitting outside with Grampie. They just sat, no work, until the thunderboomers made them come inside. Otherwise, a quiet weekend, hope you all had a great weekend. 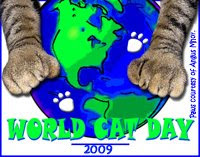 Treat your cat wonderfully today. It's our day! Plus I think this fits really well, it was on LOL Cats yesterday. Last weekend when mum took me out in my porch we had lots of time to watch for birdies. Mum gets her fancy flashy box out and takes lots an lots of pictures. Please biggify for maximum enjoyment. Mum's favorite, the hummerbirds. She hadn't seen many this summer, but then realized she really hadn't taken the time to sit and watch for them. Once she did take the time, she saw them. Mr Goldyfinch sitting on the cone flowers, getting ready to see if the seeds are ready to eat. Mr Red Wing Blackbird in for a snack. And a few fuzzy things that are not really fevvers. Do you see the tiny bee too? Mum went to a talk at the library about gardening for butterflies last week. She learned a few new plants that might be good to add to our garden. But the lady said it has been a bad year for butterflies, cool etc and mum hasn't seen very many this year. So sorry no butterfly pictures, at least for now. Don't worry about my chewing on cords, electrical or otherwise. I don't. I just really, really, really like that plastic thingy that comes off the soda bottles and mum is right there to snoopervise while she lets me chew. I don't get to chew enough to get something to swallow, mum won't let me at it that long. I have a chewing fetish, I love to chew on things that I shouldn't. Mum thinks I was weaned too soon, that I have to chew on stuff. Plastic, bags, just chewing in general. You can't see my mouth on this picture, but mum had cut the plastic thingy that holds the soda bottles together. Me I want it, chew, chew, chew. Does any other kittie do this too? Yep, it was one of those weekends. Mum was home and she cleaned on Saturday, so the sucking monster was out and making lots of noise. If she was in one room I moved to the other end of the house. So it wasn't too bad and now the house is nice and clean. Plus she did all the shopping, the laundry and then went to the library for books. That meant mum had an easy day on Sunday so we both chilled. Mum even took me outside in my portable porch. This is the firsted time she has done this so far this year. What took you so long mum? Yeah, a nice stretch and roll looking at Virginger. We checked out all sorts of birdies, even the hummers were zipping around the yard. There is PHE too, hi little dude, you look good with those flowers inside you. But I have this weakness for flowers, if you biggify you can see my tooth trying to get through the mesh of the porch. I want to sample the flowers! Mum was worried that I was going to get my tooth caught forever, so she took me out of the porch. While she held me then she let me sample the flowers in one of the hanging baskets. Then she just cuddled me for a few minutes and then let me go back inside the house. I had me a snack and then a nice long nap. Plus a Happy Purrthday to Miss Lynn.